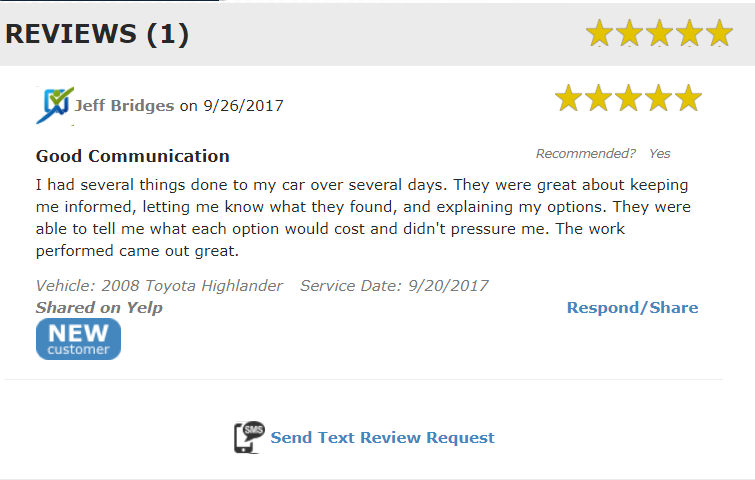 Consumer reviews are a great way for auto repair shops to get helpful feedback about their businesses and consumers to learn about the shop’s services. Often, these reviews can be the deciding factor between your shop and a competitor. If the shop has a valid email address for a customer, The SocialCRM service will email a request for a SureCritic review to that customer each time a repair order is closed for a repair on their car. 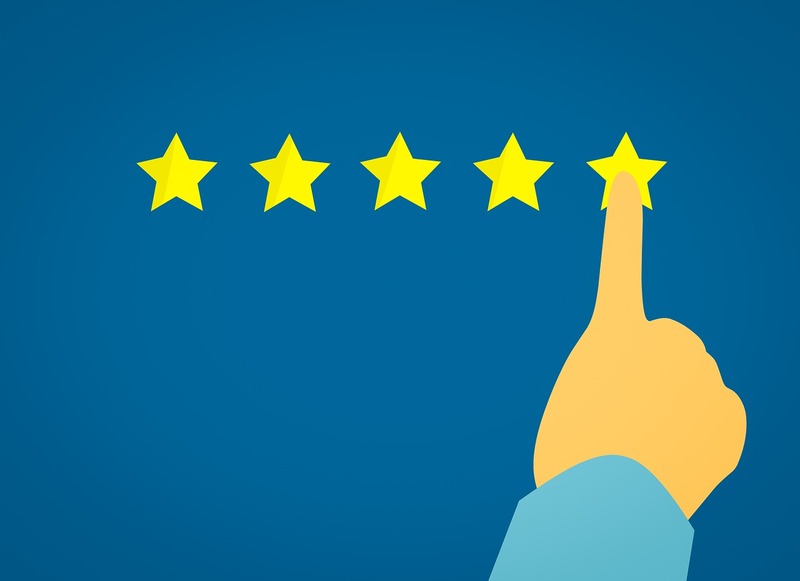 Soliciting these reviews yourself might make you slightly uncomfortable because you are not sure what you will get back and managing them might seem daunting, but you can make reviews your shop’s competitive advantage that brings more customers in the door and coming back. The SocialCRM team has some great tips to help you get more reviews and how to respond to and leverage them to your benefit (see More Information below). For example, in a recent blog post, I addressed “The Art of Responding” and best practices for responding to reviews and how to format those responses. All of these tips are great when dealing with reviews online, but unfortunately, sometimes a low score is better dealt with offline. This blog post is going to focus on how to contact the reviewer, resolve the issues, and go through the ReScore process with the people who have given you a low score (3 stars or less). The goal is to help you maintain a good online reputation and get the consumers to return to your shop in the future. Too uncomfortable to contact: Because of the nature of their complaint, it would be too uncomfortable for both you and the customer to contact them. These would be situations where you believe that nothing good would come from contacting the consumer. So, for that reason, we would not recommend you contacting these customers. No Answer: These are customers who will not pick up the phone when you call. Leave a message for these people, and in a calm voice and non-aggressive or accusatory way explain that you are looking for their very-welcome feedback. Also, leave your contact information. You will find that many people are very brave with their words when sitting behind a keyboard, but when they see you on caller ID, they might be reluctant to pick up the call and have that conversation. They’ve answered: These are the customers that you actually get on the phone and have a conversation with. Let’s talk more about these customers. As a business owner or team member, your obvious main goal is to get that rescore to maintain your online reputation and get that customer back. However, the message I promote to the shops I work with is ultimately the ReScore is not about getting a better score; it’s all about the customer. The whole purpose of the ReScore is to contact unhappy customers, have a true fact finding conversation with the goal of improving the quality of service you are providing and, if needed, make amends with that customer. The goal is not only a better score but to bring them back into the shop. In order to do this, the key things to remember are to make them feel that you are listening to their concerns and are willing to take corrective actions. We have found that if you are able to resolve the customer’s issue, most of the time they will agree to give you the better star rating. It may come down to an apology or maybe even offering a free service. If you are able to get this done, many times you will convert the customer into a loyal customer. When your customers feel that you are legitimately trying to resolve their issue and improve your overall service, they are more apt to change their opinions and, yes, give you a better score because they can feel your sincerity. Even with that said, no matter how hard you try, you will never win back everyone. But it is all about making the customers who are willing to talk to you feel like their concerns are your concerns, and that you will go above and beyond to provide them with the service and satisfaction they deserve. Barry Simon is a support agent for the SureCritic Survey and Reviews Program at SocialCRM. He is responsible for supporting and training employees on the SureCritic program as well as working directly with customers.